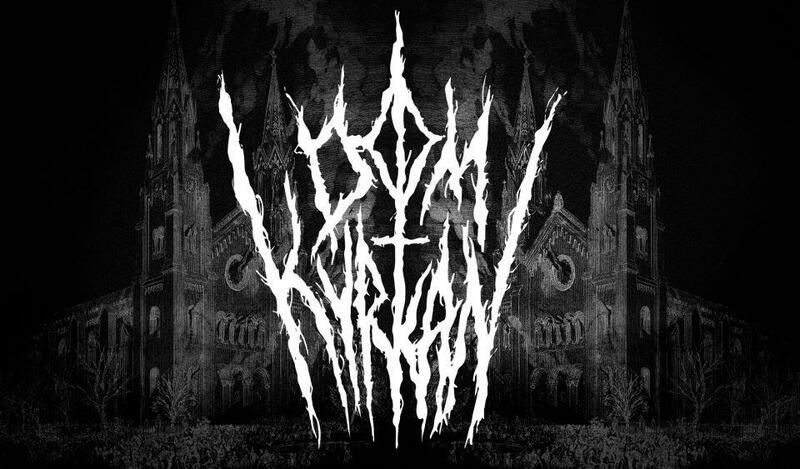 Domkyrkan in Swedish can be translated as Church Of Doom and this webzine is dedicated solely to Reviewing & Interviewing Doom Metal Bands. In culinary terms they say that the very first bite is actually with the eye. 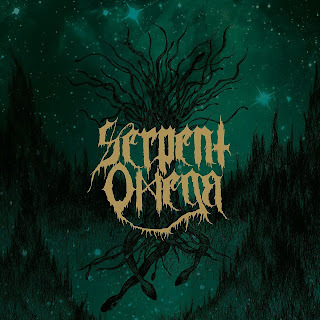 I'd like to think that in musical terms the same applies and if ever my point was evident it is with the artwork of Swedish Sludge Doom quartet Serpent Omega and their debut full length album released on vinyl only through Britain's own Mordgrimm! Created by front lady Pia Hojberg the album art is a true masterpiece, a subtle forest landscape of nocturnal greens set deep into a green tinted starry sky, and standing prominently and proudly over this eye catching scene is the bands logo, dripping with underground Metal chic and boldly stating that Serpent Omega have arrived and to be prepared! Opening track 'Skullwand' sets a perfect tone for this album which it's serpentine lyrics and fast,aggressive riff-age. Here the bands Sludge influence is razor sharp and within moment a pummeling has begun, lead by the rolling rising riffs of guitarist Andreas 'Jonsson' Westholm and bolstered by the meaty bass play of Tomas 'Brief' Westberg whilst behind them Sakke Sexton on drums batters and destroys the remaining threads of tranquility with furious aggression and a slightly muffled sound which together with the echo strewn powerful vocals of Pia Hojberg give the opening tracks a really oppressive and powerful cloaking feel, like the band have snared you into their musical net, sat you down, made you feel right at home and are now turning the tables by repeatedly drowning you in wave after constant wave of fuzzed out Doomed up savagery! Vocally Pia's aggressive style crossed with some artful mastering makes the perfect sound to fit into the Serpent Omega mould and never more is this true than during the slow, calculating and ominous 'Smoke Ritual'. As the name suggests this is a truly ritualistic song and it's bass heavy crushing tones are tempered by vocal work that rise up at you as from a tomb. Indeed the mental aspect of this rack brings to mind Pagan rituals long since abandoned by the majority but still remain in the hearts of the few, priestesses and druids stand bearing torches of flame underneath a starry nights sky, blood is spilled in celebration and the serpent worshiped intently. Each person will of course take their own meaning from each song but to my minds eye this is what the band create within me! Flip the record over and you are instantly treated to my own personal favourite from this album... 'Warmachine'. 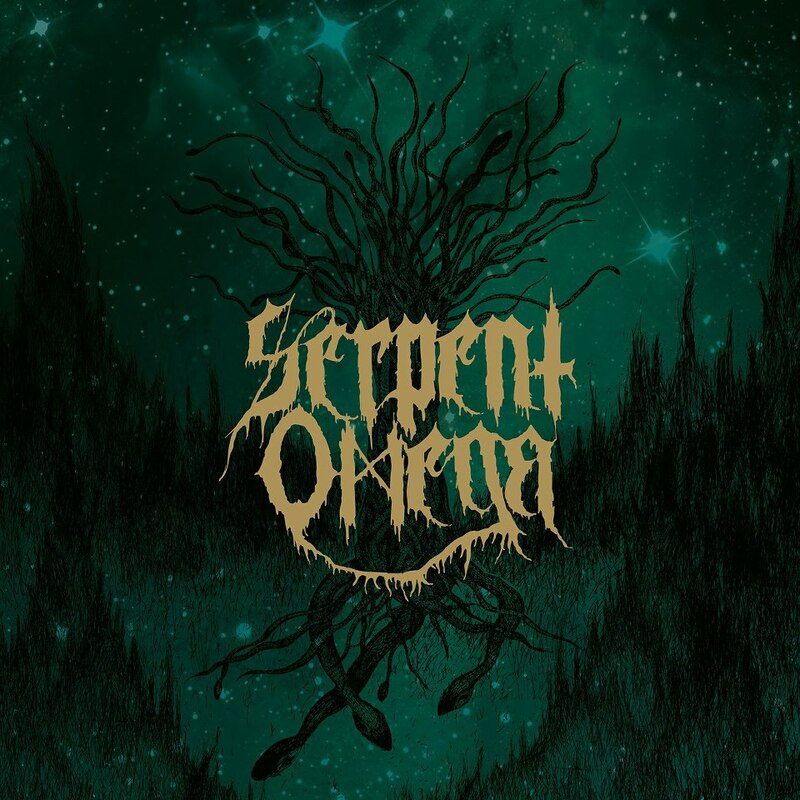 Fast, belligerent and rampaging Serpent Omega increase the intensity for this track and fuse their already abrasive sound with hints of cold steely Black Metal one moment whilst hammering out infectious intricate riffs drenched in groove the next. It may be a shorter song but it's impact both musically and lyrically charged and deadly and from it I feel a point being made that now more than ever our world stands on a precipice of war, danger and death brought about by a constant global bombardment of religious oppression and narrow minded thining. Take away the social context though and what you are left with is an downright killer, a song that will force you to lose your mind and bang your head until your neck screams in fury for you to cease! Equally as strong and as devastating is 'Red Sun' whose opening moments are once more gripped by the cold metallic fingers of a more dark and lurking force before the band once more open the taps and ride the waves of sludge soaked riff-age whilst at times more whispered, serpentine and calculating vocals add to the tracks mystique and evil intent. Like the last track though if you move past the in depth lyrical content and strip away it's meaning you are once more left with a bruising crippling beast of a song that is as remorseful in it's approach as a panzer tank to the face! In the same vein 'Serpent Omen' increases the intense experience further, ramping up the violence and aggression in this short blitzkreig attack before leading into the more challenging and thoughtful 'Konflux'... the song that sadly bring this intoxicating album to a close. This slowed down, calculating track, wreathed in darkness but with softer, cold and more haunting passages ends what is for me going to be one of the albums of the year! Mixing subtlety and thoughtfulness into an ocean of flat out aggression, abrasive sounds and musical dominance, Serpent Omega have gone from a band I'd never heard of... to a band I couldn't live without! SERPENT OMEGA to support HOODED MENACE! I am the owner of Metal Webzine Destructive Music.